remove all other joystick devices or usb simulator adapters. plug-in the usb cable into your computer. Connect an USB joystick or USB transmitter adapter before you start neXt. The input monitor window displays the incoming remote control signals. Up to 20 channels are possible depending on your dongle or adapter. Each function (collective pitch, rudder, aileron and elevator) should move a slider. If not, you have to change the channel in your transmitter to an other channel. For Futaba you can do this easily in the transmitters function menu. Your USB interface may be incompatible when you have tried all other channels without getting a response in the input channel overview. The RX2SIM offers up to 8 proportional channels and works with all common transmitters on Windows, Mac OSX and Linux. It's a wireless simulator adapter. You don't need a trainer port in your transmitter, you simply need a receiver. Make sure that your computer has an Internet connection when plugging in the RX2SIM the first time. The needed driver will be downloaded and installed automatically. Switch the RX2SIM into joystick mode (mode LED purple: game controller). Plug in the RX2SIM into a USB port of your computer and press the black knob at the side of the RX2SIM for a short time. Then the mode LED changes to purple. You should define special functions always as slider (for example autorotation). We describe two receiver types. Connect the Futaba R6008HS with the delivered cables to your RX2SIM. This should work with all brands because the servo outputs are standardized. Switch the input mode of the RX2SIM to 'Single Channels'. Press and hold the black knob until the input mode LED changes to the next type. Then you can release the black knob. Repeat this until you have reached the needed input mode. The blue input mode LED will light up continuously if RX2SIM detects proper input signals from the receiver. The input mode LED flashes if there is no valid input signal detected, which might be caused by selecting a wrong receiver type, transmitter turned off or improper operation of the receiver or transmitter. 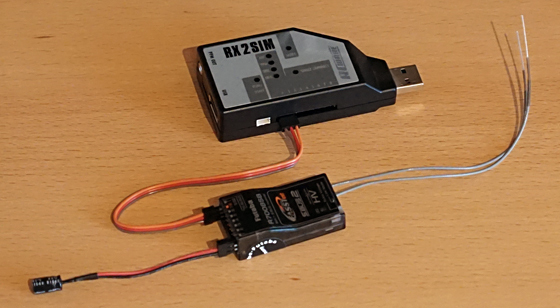 Switch the Futaba R7008SB into SBUS mode and connect it with one patch cable to the RX2SIM. Switch the input mode of the RX2SIM into 'SBUS' mode. For some receivers, you need an capacitor to stabilize the cut-in voltage (330µF, 16V). For example Futaba high voltage receivers and JR receivers. Without these capacitor, the receiver goes into low voltage error mode. You don't need the capacitor for RX2SIMs that are delivered later than 8-25-2016. JR XG14 TX has 3 X.Bus modes, it needs to be Set on INH. 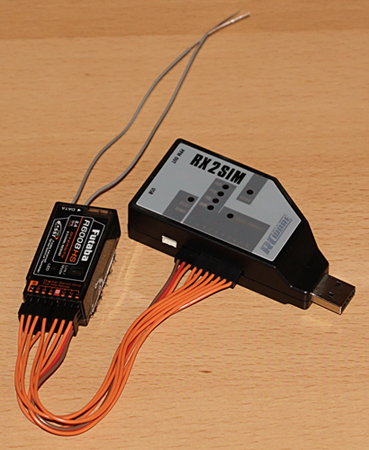 When using a single Spektrum® remote satellite connected to RX2SIM: The bind sequence on the receiver must be initiated by RX2SIM. There are cases where its not necessary to update the firmware of the RX2SIM. In case you don’t use flight conditions/modes in reality, you dont need to configure them in the simulator either. Simply select the appropriate preset with the number keys 1, 2, 3 and 4. An FMS compatible USB dongle is compatible with Windows as well as with Apple Mac OSX computers. It is however important to use an adapter that is compatible with your transmitter, especially for mini jack adapters as there are differences for mono or stereo signal routing. Reduce the servo travel in your transmitter if the input monitor shows + or -100 before your sticks reach their physical end of travel. In our example we use a Futaba FX-30 and haven't changed any center or travel adjustment. You can disable any undefined or flickering channels. Just click onto start calibration and follow the instructions and the neXt calibrates the output to -100 / 0 / +100. The sticks shown at the bottom of the screen will guide you visually and display the requested input. You can customize the transmitter mode in the settings > input device tab of the neXt simulator main menu. Select your stick mode also in settings > output device. Reduce the deadzone as much as possible. The sticks in neXt should not jitter. As a rule of thumb, the poorer the signal quality, the larger the deadzone. When using an RX2SIM, the value 0 is perfect. Set it to 1 or higher for other dongles. First of all, we define a new model. Select therefore the 'LNK' button. Then select the 'MODEL SEL.' menu and press 'RTN'. Select 'NEW' and press 'RTN'. Now the new model is defined. You can rename it to 'neXt'. Switch off your transmitter and plug in the simulator cable. Your transmitter switches on automatically and shows in the display 'DSC / TRAINER CABLE IS DETECTED'. Select the 'LNK' button on your T14SG. Then select the 'FUNCTION' menu. There are already functions for Aileron, Elevator, Throttle and Rudder defined. Where they should be depends to the USB adapter. Please take a look at the two examples below. It's a good idea to disable the trim functions by defining '--'. Scroll down to page 2. The SE switch is already defined as GEAR. Then move to the 'VPP' row and assign there for example the 'SB' switch. Now You can check the output by pressing the 'U.Menu/Mon.' button on your transmitter (servo output). Start the neXt simulator up, press esc and change to settings > input device tab. Now take a look at the input monitor window. Each function should come out on one channel or button. Now you can start the calibration and follow the instructions there. These are two example setups for the FUNCTION menu of your transmitter. There are already functions for Aileron, Elevator, Throttle and Rudder that have been defined (channel 1, 2, 3 and 4). Don't touch them while they are working. Scroll down to channel 5 and change the function name to 'Auxiliary1'. Then move to the 'Control' row and assign there for example the 'SB' switch. Start the neXt simulator up, press esc and change to settings > input device tab. And select functions in the input device tab. Now take a look at the input monitor window. Move your 'SB' switch. If there is a button changing? Then you continue with the 'Button' workflow. If there responds a proportional channel to the switch? Then you continue with the 'Slider' workflow. Move the 'SB' switch to position off (motor on). If you are using a button our your remote control, click on button, otherwise on switch. Move the 'SB' switch to position on (motor off). You will now be able to recognize what assigned button is controlled by the 'SB' switch in the autorotation line. Click assign in the autorotation line and then onto slider or stick. Move the 'SB' switch to position on (motor off) and click next. You will now be able to recognize what assigned channel is controlled by the 'SB' switch in the autorotation line. Follow the GUI instructions for stick calibration. You can re-enter the button configuration screen later without having to re-run the stick calibration section. Select functions in the settings > input device tab. Start with throttle hold forward, idle up centered, dual rates forward and flaps gain centered. Click assign for flight condition 1, then on switch and move idle up switch forward. Click assign for flight condition 2, then on switch and center idle up switch. Click assign for flight condition 3, then on switch and move idle up switch back (towards you). Click assign for flight condition 4, then on switch and move dual rates switch down. Anytime this switch is down, flight mode 4 will take precedence over all other flight modes. Click assign for restart, then on button and press the red button. Click assign for landing gear, then on slider, turn knob fully clockwise and click next to complete. Click assign for autorotation, then on switch and move throttle hold switch back (towards you). It is helpful when opening neXt to have the throttle hold active (switch down), idle up set to middle position, flight mode 4 active (dual rate mode switch down) in order for the program to detect proper switch positions. Use a regular USB cable, no other USB adapter is needed. There are cases where its not necessary to update the firmware of the RX2SIM. In case you don’t use flight conditions/modes in reality, you dont need to configure them in the simulator either. Simply select the appropriate preset with the number keys 1, 2, 3 and 4. If you would like use the neXt simulator with the Reflex XTR or Aerofly USB dongles on Apple Mac OSX computers, you will need to switch the Reflex dongle into joystick mode (Instructions). To use with Windows XP and Windows Vista, it is also necessary to adjust the servo center point and travel on your transmitter. Take a look at the input monitor and move your sticks. The slider should not skip. The Aerofly dongle is working on Windows 7 and higher without any known issues and does not require any changes in your transmitter. Use the servo center adjustment in your transmitter to move the sliders as far as possible to the center in the input monitor window. The channels must not exactly be located at zero. Disable unnecessary channels in the input monitor. Before you start the calibration, go into your travel adjustment menu of your transmitter (on Futaba these are called 'Endpoint ATV') and limit the servo travel. The output should never skip or limit at 100%. Reduce the servo travel in your transmitter if the input monitor shows + or -100 before your sticks reach their physical end of travel. Now, lets proceed with the calibration. Just click on start calibration and follow the instructions. The sticks shown at the bottom of the screen will guide you visually and display the requested input. The default transmitter mode is mode 2. You can customize the transmitter mode in the settings > input device tab and settings > output device. We reduced the deadzone to 2. Newer reflex XTR dongles have a ribbed button for switching the dongle into it's joystick mode. Connect the dongle to the USB port (if possible not to a USB hub and pull off other dongles). Press the button on the dongle and hold it down until one of the two LEDs will go out. Then you can release the button. Disconnect the dongle from the USB port, wait briefly and plug it in again. So you have switched the dongle into the next 4 possible modes. When the stick is in the joystick mode, the LED is flashing twice (mode 2). All names of merchandise and trademarks mentioned in this webpage are presumed to be propriety of the respective companies.